Time to spruce up the man-cave? In this buyer’s guide, we’ll review 10 of the best pool table lights and fixtures on the market right now. We’ll take a look at both rustic and contemporary options, including single-lamp fixtures and island-style lights. After that, we’ll outline some key things to consider when choosing pool table lighting. If you’re looking for a light that’ll last you a decade or more, you’ll want to avoid anything made of plastic. This material can easily fade in the sunlight, and is more likely to chip or wear down over time. RAM’s 44″ pool table light is made using a metal frame and stained-glass walls, ensuring it’ll hold up for an incredibly long time. Although the company doesn’t offer a warranty with this light, their excellent craftsmanship makes for a very durable fixture. There are four lights inside the canopy and three feet of chain is included on each of the two hanging points, meaning you can install the fixture as high or as low as you want it. These lights do an excellent job illuminating your table surface but won’t drown the room in light – the stained glass helps to diffuse excess brightness. You have to pay a fair bit for the quality you get though – this isn’t a cheap light fixture. However, if you’re looking for a durable, stylish, and also highly functional rustic light, RAM’s fixture is a fantastic pick. Because they’re a company that actually specializes in making furniture, you know you’re getting what you pay for. Excellent quality – very durable. Does a great job focusing light on the table, eliminating shadows. 3′ of chain included on each side. Quite expensive, but you get what you pay for. If you’re looking for something a bit cheaper (and more modern-looking) than the RAM fixture we just reviewed, this light from Chende is definitely worth checking out. 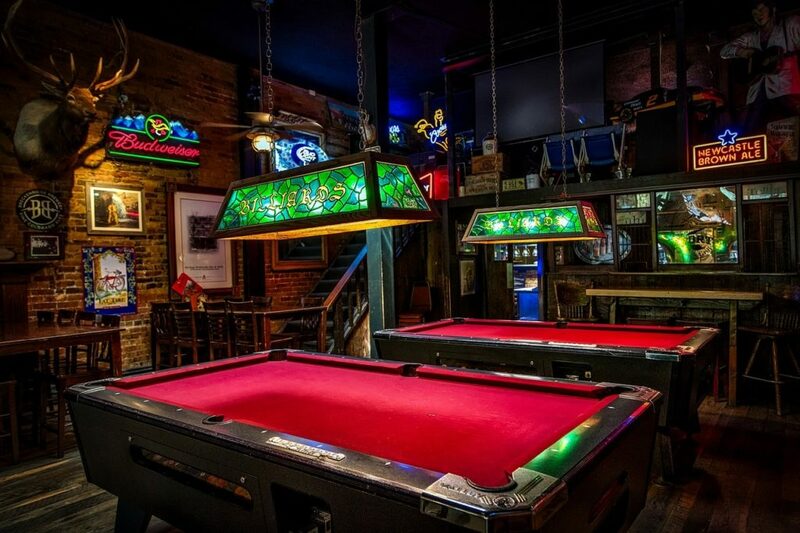 Instead of the canopy design, you get four individual shades, which do an excellent job illuminating 7, 8, or 9′ pool tables. They also fit in really well in contemporary settings, as well as more modern-looking man-caves. You can choose from black, blue, red and green, meaning you can go for whatever works best with your intended location. Above the light fittings you’ll notice a set of decorative billiard balls for that little bit of extra flair. The best thing about these lights though is how durable they are considering the price. They’re made of wrought iron, meaning you’d find it hard to do any lasting damage with a cue stick. Plus, they’re designed to be used with super-bright E26 LED bulbs, meaning you can completely eliminate shadows if you hang the pendants low enough. Sadly, you’ll have to buy these bulbs separately. Nice and long – enough brightness for any table. Looks great – 4 different colors available. None to mention – fantastic light for the price. For those with pool tables that aren’t located in a separate games room, the stained-glass pool table lights can look a little out of place. Fortunately, there’s a few different multi-lamp options that will fit in with other vintage fixtures and fittings. The Millennium 1233-RBZ features a stunning ornate frame, which comes with a rubbed bronze finish. Attached are three modest-sized lamps that do an excellent job illuminating the corners and rails of your table. Although you might get a few more dark areas than you would with a single-shade lamp, this fixture is nice in that it’s not too flashy. 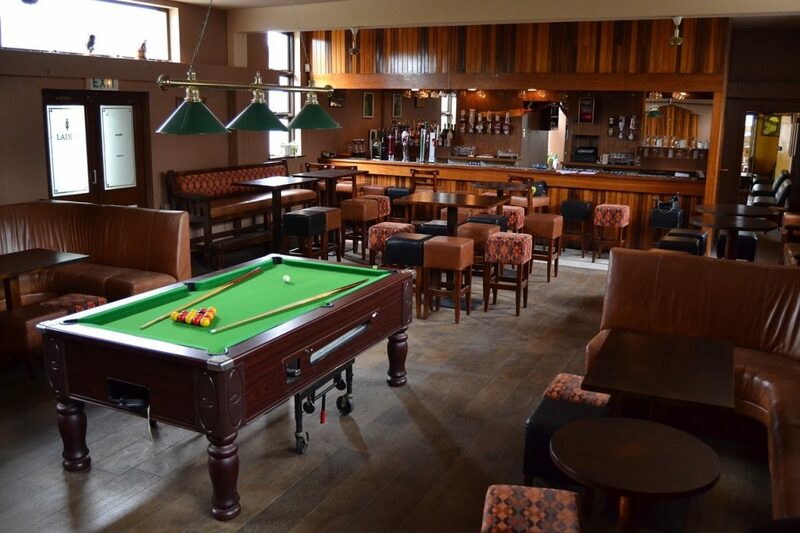 This means that the main focus of the room is your pool table – which is what it should be. Another benefit of having a multi-lamp rail is it’s much cheaper than going for a single-lamp pool table light. It’s also much lighter because there’s less glass involved, which makes it easier to install and less likely to crack. Some stained glass can also be a bit tough to clean – you won’t have this issue with these lights. Nice and light – easy to install. Modest lamp shades – doesn’t steal the focus from your table. Not made specifically for billiards, although it does a good job illuminating pool tables. 36-44″ lights are unlikely to offer enough illumination for an 8 or 9-foot table, unless you hang them quite low. If you want to keep the fixture relatively high, Iszy Billiards makes a 72″ long pool table light fitting. Essentially, this is a simple, cheap option – it’s focused on functionality. Despite being relatively inexpensive, the rod is made of brass and the shades are crafted with metal, so the overall quality of this light is quite good. It also performs very well – the inside of each shade is painted bright white to refocus the bulbs and ensure that the entire table is well-illuminated. The chains have plenty of room for adjustment when hanging the light, so you can keep them short if you want the fixture out of the way. Iszy Billiards also offers this light in three different colors – green, black and burgundy, so it’s not hard to find something that’ll match your pool room. As you’d expect from an island fixture, it’s relatively light, however the included installation instructions can be quite confusing to use. The only other thing we can fault this light for is its durability. Although it’s relatively well made, and doesn’t have any plastic, it can begin to show signs of wear after a few years or so. Considering what it costs, this is sort of to be expected. Multiple styles to choose from. Hanging instructions can be confusing to use. Although this chandelier isn’t designed specifically for use above pool tables, it’s an neat little way of accentuating a rustic-style games room. This light from LALUZ is one of the best-looking retro options out there. Finished with wood as well as metal, it’s guaranteed to stand out when you have guests over. Plus, there are 5 other similar styles available if you’re looking for something a little smaller. We’ve picked the 5-bulb option because it’s the longest, at just under 40″. When paired with E26 bulbs, it has plenty of brightness to completely illuminate 7′ and 8′ tables. If you’ve got a 9′ table you should be fine, as long as there’s some ambient light in the room it’s located. Considering the build quality of this product, its price is very reasonable. The only issue with it is how hard it is to install. Although it’ll attach to both flat and sloped ceilings, the screws aren’t long enough and sometimes their holes won’t match up with the mounting plates. It’s a good idea to get a handyman in if you’re not incredibly experienced with difficult light installs. Looking for that little something extra? Featuring beautifully intricate, hand-crafted, stained-glass detailing, this is one of the most awe-inspiring pool table lights on the market right now. Its glass is painstaking copper-foiled, ensuring that the patterns stand out even when the light is turned off. The panes are then secured in a matte bronze frame, making for the finishing touch on the stunning dragonfly design. This fixture isn’t just a piece of art though: it’s functional too. Even though it only has three bulbs, they provide more than enough illumination for 8′ and even 9′ tables. This light is effectively focused straight down onto the felt, helping to conserve energy. If you use other lighting sparingly, you can maintain that cozy feel while still being able to see every ball, pocket, and speck of dust on your table. The downside to all these positives is the price – this is quite an expensive light. However, you definitely get what you pay for. Dale Tiffany are lamp specialists – they know their stuff when it comes to lighting. As a result, this is one of the best-quality (and most durable) fixtures on the market. It’s quite heavy though, so we’d recommend having an electrician install it for you. Stunning design which is sure to attract compliments. Excellent illumination, even on 8/9′ tables. Not too big/bulky – 3 bulbs. Very expensive, but you get what you pay for. BAYCHEER’s island light isn’t designed specifically to be used with pool tables. However, because the company is a furniture specialist, this fixture provides excellent illumination. The bowl-shaped shades help to focus the light on your table’s felt, eliminating those pesky ball shadows. Because the fixture is made of metal, very little light leaks into the surrounding area, allowing you to retain control of your room’s illumination and mood. These lights are fairly expensive, which is their major downside. However, they’re quite durable and won’t begin to show wear or fading for many years after installation. Another benefit of this product is the industrial/rustic design. The elegant black finish works well with nearly any color palette. If you’re using black highlights (on your table, for instance), this fixture would make an excellent fit. Hanging these lights can be a bit tricky – there’s a lot of metal involved so the fixture is fairly heavy. However, BAYCHEER has great customer service. They promise to offer any advice/help you need when hanging the lights if you’re doing the job yourself. Very bright, but won’t leak much excess light into the surrounding room. Company offers great customer service. Some pool tables come with alternate surfaces which allow you to play air-hockey or ping-pong at a moment’s notice. If you’ve got one of these tables, it’s a great idea to get a light that you can adjust really easily so you’re not constantly hitting table-tennis balls into it. This is where the Westinghouse island light excels. It’s one of the only fixtures on the market to feature a pulley system, which can be used at any time. Plus, there’s plenty of included hanging chain, meaning you can get it in just the right spot when installing the light. Another great thing about this pendant is its rustic look. Westinghouse has gone for a black, oil-rubbed finish, resulting in a bare-bones vintage feel. If you’re working on a midwestern/cabin/retro-style refit, this lamp would work perfectly. What’s more, the price is fantastic, especially considering how well-made this rail is. It even comes with a 5-year limited warranty against defects. This is a much more comprehensive guarantee than what comes with even the most expensive lights out there! N/A – one of the best lights available for the money. There’s actually very few large lights out there that are made specifically for pool tables. If you’re not a fan of the red/black/green offerings of Iszy Billiards but aren’t sure if a 40-50″ light is big enough for your 9′ table, take a look at this fixture. The Z-Lite Riviera has “golden mottle” colored lights and an oil-rubbed bronze rail. Together, they form a fixture that has a timeless, coastal charm to it. Compared to the shiny gold/brass finishes seen on other products, the Riviera is an incredibly sophisticated light. What’s more, it works in rooms with both lighter and darker moods – it’s a very versatile option if you’re looking to build the atmosphere of your games room. Although this is a fairly expensive light, it comes safety-certified by UL. Plus, since it weighs only 9.4lbs, it’s relatively easy to secure it on your ceiling. If this is your first DIY light installation, and you think you’re up to it, this fixture would be a good place to start. Large enough for use on 9′ tables. Neutral colors work well in nearly any setting. Lightweight & easy to hang. For man-caves and games rooms, regular lights might be a bit boring. But single-shade fixtures are for the most part quite expensive. This Iszy Billiards light is a fun, reasonably-priced alternative. The 59″ black metal bar is lined with a full set of pool balls to add a unique quality to your table setup. There’s also four different lamp colors to choose from: black, red, green and white, allowing you to match your felt color or go for something a little more neutral. Another great thing about these metal shades is how well they hold up over time. They don’t fade in the sun, and won’t chip/scratch if your buddy or kid flicks it with their cue stick. However, even though you only get three lights, this is a fairly heavy fixture – it ships at 40lbs. You’ll want to make absolutely sure your screws are secure before hanging it. Like most other Iszy Billiards lights, this is a reasonably-priced option. It’s also UL listed, and can be converted (with a separate adapter) to run out of a power socket if you’re unable to access your ceiling box. Plenty of chain length is included at each side, meaning you can hang this fixture as high or as low as you need it. If you’re building a pool room or redecorating on a budget, this is a fantastic pick. Unique style, suited to pool. Multiple colors available to match any games room. Bit difficult to hang at first. A vintage-style pool table light. In this part, we’ll detail some key things to consider when buying and installing a pool table light. The lights you choose will contribute a great deal to the aesthetic of your pool table room. This is why it’s important to consider the style you’re trying to go for. Specialized pool table lights are designed especially for pool tables. They feature a single large shade, which is often made of stained glass mounted in a steel frame. 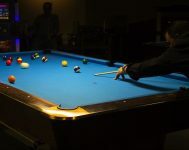 Although these fixtures can be quite expensive, they offer the best possible lighting for your pool table – illuminating the entire surface without leaving dark spots. Island lights, on the other hand, aren’t made just for pool tables. They can be used above breakfast bars in your kitchen or above dining tables too, although they work great for billiard tables as well. Island lights are very popular because they’re relatively inexpensive. Most of these products don’t offer that billiard-themed aesthetic that other pool table lights do. However, there are a few multi-shade lights made especially for pool tables out there – they work great for building games rooms on a budget. Remember, if you buy individual lamps (rather than a bar fitting), they might need a bit more support. Consider using a cross-brace if the lamp is particularly heavy. There’s no strict guide for what size fixture to get. The general rule is you should leave 12″ or so at each end of the table. Your light should never be longer than the table. Also consider how many lights come with each fitting. Most single-shade pool table lights use three or four bulbs. If you buy an island-style fitting with multiple shades, it’s easy to determine the number of lights from the listing images. 7′ tables: 3 lights, 40-50″ in length. 8′ tables: 3/4 lights, 50-60″ in length. 9′ tables: 4 lights 60-70″ in length. Some lights are more powerful than others, particularly specialized pool table lights. Therefore, it can be OK to use some 44-50″ lights on 8/9 foot tables. However, you might have to hang the light fairly low. Snooker tables will require 4/5 lights on a fitting 70-110″ in length (depending on how big your table is). Something that looks good and fits the atmosphere of your pool room. If the light feels out of place, you’ll soon want to replace it. An extended warranty for peace of mind when buying. A reasonable price. Unless you find the fixture that’s a perfect match for your table, it’s probably not worth blowing $700+ on it. However, don’t go too cheap either: low-quality lights just aren’t worth having. A light that’s height-adjustable. This is particularly useful if your table has multiple surfaces, like one for ping-pong. Good reviews. Other buyers will be sure to let you know if a fixture is garbage. UL certified or listed fixtures. UL is an American safety certification company who check products for quality, energy efficiency, and safety. There are some stunning stained-glass pool table lights out there. Fortunately, since they’re designed specifically for use above pool tables, they tend to illuminate the surface very well. On the other hand, there are also tons of cheaper options (mostly island lights) on the market too. The great thing is, most of these options are made by companies that specialize in lighting. Therefore, they’re very bright, but look pretty nice too (especially if you can find one that matches your interior design). The only downside to these cheaper island lights is they can leave dark spots on your table (particularly in the corners) because they’re not designed with pool tables in mind. However, this isn’t a big deal really unless you’re a super-serious player. You can prevent this from happening by hanging the light a little lower than you normally would. Since your light will be powered by the mains, it’s a good idea to get a qualified electrician to hang your fixture. It’s a good idea to install the light before setting up the table. This makes it easier to access the ceiling and will prevent bits of drywall, paint or wood from ruining your felt. However, you’ll have to know how tall your table is so that the light can be hung the correct distance from the surface. If you’re not sure what table you’re going to be fitting just yet, install the light about 62″ off the ground. If your table is already in place, be sure to cover it to protect the surface from damage. Ideally, the light should be hung around 40 to 70 inches from the surface of the table – consider how high your ceiling is and how much chain is included with the fixture. The World Pool-Billiard Association (WPA) says that the light should be spread evenly on the table (meaning no dark spots). They also say that the entire table should receive 520 lux of light. Lux meters can help you to measure light levels and ensure your fixture is installed properly. Make sure you’re able to center your light in the middle of the table. If the light is installed in the wrong place before the table is set up, you’ll have to choose between a slanted table or an off-center light. Be sure to tell your electrician exactly where your table is going and how big it is. If you’re a DIY-type, it’s possible to install the light yourself. However, we wouldn’t recommend it unless you really know what you’re doing. First, you’ll need to find a stud in your ceiling with a stud finder. Next, drill some holes in the studs in accordance with the dimensions of the fixture. You will also need to drill additional holes for the wiring. Now, screw in your hooks. It’s very important that this is done properly, as billiard table lights tend to be very heavy. Then, measure the required distance to the surface of your table and hang the light accordingly. Turn off the mains power and wire the light to your ceiling junction box. You’ve reached the end of this buyer’s guide! Hopefully you found the right lighting solution for your pool table. If you’re still not sure what to get, leave a comment below and we’ll get right back to you.